Best ever festival! 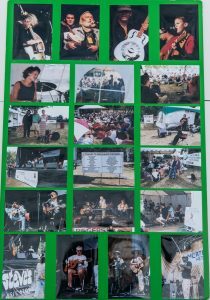 That was the consensus of performers and festival goers alike for the 1999 CKCU Ottawa Folk Festival, held from August 27 to 29 at Britannia Park. The record-breaking crowds were treated to blue skies, warm summer weather and an impressive lineup. The festival attained a high level of professionalism evidenced by superb performances, and excellent lighting and sound. Several musicians including Jane Siberry, Ian Tamblyn, Lucy Kaplansky and Lynn Miles lavished praise for the festival. A particularly warm response was extended to Chopper McKinnon, who accepted the Helen Verger Award. Chopper and Karen Flanagan McCarthy returned to host the main stage throughout the festival. Daytime sessions held in Lakeside Gardens were particularly well attended. The hilarious Laugh It Up session featuring Trout Fishing in America, Vance Gilbert and Jane Siberry was standing room only. Festival staff had to turn people away from the Burgundy, Bailey’s and Bourbon workshop with Laura Smith, Georgette Fry and Margo Timmins, as the hall was filled to capacity. A record number of performers from south of the border appeared. American acoustic music was well represented by Karen Savoca, Trout Fishing in America, Annie Gallup, Cry Cry Cry (Dar Williams, Lucy Kaplansky and Richard Shindell), Vance Gilbert, Bill Morrissey and Chuck Brodsky. Some magical moments included Jane Siberry performing an improvisational version of “The Water is Wide”with cellist Jorane Peltier on Saturday evening. Those who gathered for a Tom Wilson showcase on Sunday afternoon were treated to a one-hour performance from the supergroup Blackie and the Rodeo Kings. Finally, Inuit performer Lucie Idlout proved that popular music can take on serious social issues and still rock. 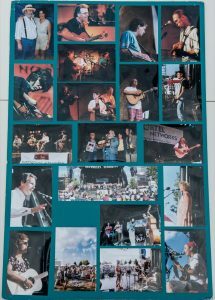 A special photo exhibit opened on Monday, August 23, at the National Press Club at 150 Wellington Street featuring photography of the folk festival by Nix Wadden, Jim Commins and Dave Haggerty. Mike McCormick, a member of the wacky and wonderful The Arrogant Worms entertained those who turned out for the event. The festival preview concerts began on Sunday, August 22, when Trace Elements performed at the Chapters store in Kanata. A series of free lunchtime concerts held at the World Exchange Plaza began on Tuesday, August 24, with a double bill featuring Ian Tamblyn, along with Andrea Karam and Fred Guignion. On August 25, Wendy DeMos and the African-influenced rhythms of Mel M’Rabet were showcased. The Unceded Band and Laura Smith performed on August 25. Several late-evening concerts were held at the Luxor Hotel from August 26-28. These popular concerts featured the likes of Laura Smith, Richard Wood and Trout Fishing in America. The CKCU Ottawa Folk Festival is grateful for the generosity of its sponsors: Nortel Networks, Ottawa Folklore Centre, the Luxor Hotel, Ottawa Citizen, Rogers Community TV, Phase 2, CBC Radio One, Bell Mobility, Ontario Arts Council, Loeb, Ginn, CKCU, US Airways, VIA Rail Canada, Michael Davies Plymouth ChryslerLtd., Steve’s Music Store, Pepsi, CS Co-op, Alexander Keith’s India Pale Ale, Chez 106, National Library of Canada, Mexicali Rosa’s, Nutshell Music, Chapters, Regional Municipality of Ottawa-Carleton, The Ottawa Food Bank, X Press, Canada NewsWire and Human Resources Development Canada. On Friday, August 27, Blackie and the Rodeo Kings (Stephen Fearing, Colin Linden and Tom Wilson) performed a lunchtime concert outside the HMV store on Sparks Street. Friday evening opened in traditional festival manner with Arthur McGregor, owner of the Ottawa Folklore Centre performing a charming acoustic guitar version of our national anthem. First up was Ottawa singer- songwriter Jennifer Noxon, who entertained the crowd with her original compositions. The Angstones werenext with an energetic set including the local favourite, “Bytown It’s My Town”. The musical surprise of theevening was Karen Savoca, a dynamic conga-playing singer-songwriter from Syracuse, New York. Njacko Backo presented African-inspired music. Jorane Peltier, a young Québécois cellist with a dramatic vocal style, dazzled the crowd with her imaginative original compositions. P.E.I. fiddling sensation Richard Wood gave a high-energy performance that was received with much appreciation. The audience enthusiastically received Lynn Miles, whose set included music from her latest CD, Night in a Strange Town, and some new material inspired by her life south of the border. Blackie and the Rodeo Kings, a supergroup of performers Stephen Fearing, Tom Wilson and Colin Linden, delivered a powerful set that brought the evening to a rollicking close. Saturday afternoon had so much to offer that many festival goers expressed frustration that they could not see it all! These well-attended afternoon sessions were held on six stages, a record number for the festival. The Nortel Networks Stage was the setting for the Living Traditions workshop hosted by Ian Robb and including Finest Kind, Kebba Jobateh, Matapat, Eve Goldberg and Alain Chatry. Ron Moores hostedBack 40 Live featuring the Cowboy Junkies, Sarah Harmer, Big Gravel and Sherwood Lumsden. The session was aired live on CKCU-FM for the popular program The Back 40, which features traditional country, bluegrass and old-time music. Bill Stunt of CBC Radio was also on hand to host Heartland Live, Part Ifeaturing Terry Tufts, Fireweed, Tom Wilson and Katherine Wheatley. This performance was recorded for later broadcast on the CBC Radio program Heartland, which features music from Ontario. Separate concerts were performed by Ray Bonneville and Stephen Fearing. The afternoon sessions wound down on a comical note, with Njacko Backo and Trout Fishing in America. On the Ottawa Folklore Centre Stage, the entertainment began with Alain Lauzon in concert. Ottawa Folklore Centre owner Arthur McGregor hosted a rousing Singalong Folk Jam. Terry Eagan, a folk enthusiast from Waltham, Massachusetts, hosted the Boston Connection featuring Annie Gallup and Bill Morrissey from south of the border, and Canadian performers Beth Ferguson and Rick Fines. Benoit Bourque and Alain Chatry held a session titled Learn to Play the Spoons. A double bill featuring Katherine Wheatley andJorane Peltier, two distinctly different performers from Ontario and Quebec, ended the daytime performances. The Phase 2 Stage opened with Ottawa performer Wendy DeMos in concert. East Meets West was the theme of the next session, hosted by Kurt Walther and featuring Victor Nesrallah, The Angstones and Njacko Backo. The poetic and beautiful Laura Smith next graced the stage. Paul Symes, owner of the Black Sheep Inn, hosted some acts that had performed at the popular Wakefield, Quebec club: The Grievous Angels, Sarah Harmer, Stephen Fearing and Jennifer Noxon. A double bill was provided by Richard Wood and John Prince and A Piece of the Rock in concert. There was fiddling aplenty at the cleverly named Fiddle Headssession hosted by Marion Linton, with Richard Wood, Gaston Bernard, Greg Brown and Peter Jellard. The audience was delighted when a half-hour session with Tom Wilson turned into a one-hour session ofBlackie and the Rodeo Kings. Stephen Fearing and Colin Linden were welcome additions! The entertainment on the US Airways Stage began with two local women in concert: Brenna Rivier and Sally Robinson. A session titled L’Amour was lovingly hosted by Benoit Bourque and showcased Jorane Peltier, Wendy DeMos and Luann Kowalek. The funky Stringed Things session included Mel M’Rabet, Ruth Bowen, Rick Fielding and George Sapounidis, and was hosted by Ann Downey. Vance Gilbert hosted theAmerican Acoustic I session with Bill Morrissey, Annie Gallup and Karen Savoca. The Edge of Folksession included Tom Wilson, Lucie Idlout and Martina Sorbara and was hosted by Stephanie Guzman. Ian Tamblyn was an apt choice as the host of a Back to Nature session featuring the talents of Jane Siberry andBill Morrissey. The Rogers Stage inside Lakeside Gardens opened with the comically named It’s a Dobro, Bro with Rick Fines, Doug Cox and Vince Halfhide. Guitars Galore, hosted by Alex Houghton, sizzled with the likes ofTerry Tufts, Stephen Fearing and Alan Marsden. Rasputin’s owner Dean Verger was on hand to hostRasputin’s Live with Michael Timmins, Ian Tamblyn, Ray Bonneville and Luann Kowalek. Next it was time to do a Blues Boogie Dance with Kingston’s excellent Georgette Fry Band. The most popular session of the day was Burgundy, Bailey’s and Bourbon, a session of torch songs hosted by Laura Smith, withGeorgette Fry and Margo Timmins. To end the daytime programming, the My Hometown session hosted byJennifer Noxon boasted Luann Kowalek, John Prince and The Angstones. Classical-style guitarist Andrew Mah was first up on the Ontario. More to Discover stage. Concerts by theOttawa Harp Choir and Eve Goldberg followed. Avid picker and tenor Rick Fielding appeared in concert. Three double bills were presented on this stage: Alex Houghton and Martina Sorbara; Chuck Brodsky andDoug Cox, and Sherwood Lumsden; and Vance Gilbert and Colin Linden. The Saturday evening concerts on the Nortel Networks stage opened with the contemporary country stylings ofThe Grievous Angels. Georgette Fry delivered a bluesy and emotive set. Quirky American singer-songwriterAnnie Gallup was up next with a series of riveting story songs. Cox, Fines and Brodsky provided excellent instrumentation and vocals. American troubadour Bill Morrissey delighted and amused the audience with his charming adventures in song. The lively Matapat set included Benoit Bourque stepdancing while shaving a volunteer from the audience. The Jane Siberry performance held a few surprises including an impromptu opening number with Jorane Peltier that held the audience spellbound. The ever popular Cowboy Junkies closed the most well-attended day in CKCU Ottawa Folk Festival history with their own special blend of inspired ballads. The weekend of first-rate folk music continued on Sunday morning, which dawned bright and sunny. The Nortel Networks Stage was first graced with the presence of Fireweed in concert. The group’s harmoniesare reminiscent of Crosby, Stills, Nash and Young. Poetry in Motion, hosted by Alrick Huebener ofSugarBeat, featured Jane Siberry, Annie Gallup, SugarBeat and Alex Mortimer. The mood turned to blue when Sue Foley appeared in concert with Tony D.
Then it was time for Heartland Live, Part II. The CBC Radio show was hosted by Bill Stunt and showcased the talents of Big Gravel, Eve Goldberg, Andrea Karam and Fred Guignion, and James Gordon. The afternoon on the big stage ended with Vince Halfhide and Larry “The Bird” Mootham in concert. The Ottawa Folklore Centre Stage had a diverse lineup of talent. A Singalong Folk Jam hosted by Arthur McGregor kicked off the day. The Ottawa Folklore Centre Weekend Choir was onstage for two practices, coached by Andy Rush. Workshops teaching participants how to play the harmonica, the didgeridoo, or to learn shape note singing followed. The rocking sounds of Lucie Idlout rounded out the entertainment for the day. Sunday morning was an opportune time for singing Hallelujah on the Phase 2 Stage. Host Doug Coxintroduced a spiritually oriented session with The Unceded Band, Rick Fielding, Andrea Karam, Fred Guignion and Peter Kiesewalter. Shelley Posen hosted Christmas in August, featuring Chuck Brodsky, Finest Kind and storyteller Ruth Bowen. Lynn Miles was the host of the I Can Relate to That session showcasing Laura Smith, Beth Ferguson and Tom Lips. A concert with Dar Williams followed. The mood then shifted to Celtic in a session hosted by Michaela Foster Marsh with Rawlins Cross and award-winning Ottawa Valley fiddler April Verch. Verch also joined the next session, Old-Time Fiddling, hosted by James Stephens and featuring Shane Cook, Stacey Lynn Read and Fast Forward. The fun on the US Airways Stage began with a session called Wood and Steel, hosted by Lynn Miles. Andrew Collins, Joey Wright, Andrew Mah and Paul Fenton also appeared. Dario Domingues hostedNorth Meets South with Lucie Idlout, No Reservations and Aqsarniit. Jane Siberry next appeared in concert. The final two sessions were acoustically inclined. The Acoustic Blues session hosted by Larry “The Bird” Mootham featured Tony D, Sue Foley, Ray Bonneville, Vince Halfhide, Paul Fenton and Southside Steve. 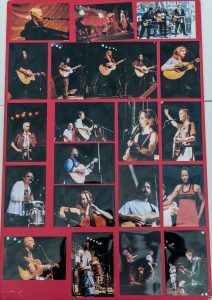 Angela Page hosted American Acoustic II with Dar Williams, Lucy Kaplansky, Chuck Brodsky andRichard Shindell. We’ve Got Rhythm was the theme for the Rogers Stage. Host Karen Savoca introduced an eclectic rhythm section including Ken Harper, Ian Tamblyn, Kebba Jobateh and Fast Forward. We’ve Got You Coveredfeatured Cry Cry Cry, Chuck Angus and host Sarah Harmer. It was time for dancing with two lively sessions:Modern Square Dancing with John Charman and Contradance for Everyone with Shindigo. Jane Siberryhosted the Laugh It Up session with Tom Lips, Trout Fishing in America and Vance Gilbert. The day’sactivities ended with James Gordon in concert. The Ontario. More to Discover Stage kicked off the day with Trace Elements in concert. Jane Radmore was onstage next. Four double bills followed: Karen Savoca and Bill Morrissey, Michaela Foster Marsh andSugarBeat, Annie Gallup and Luann Kowalak, and Matapat and Monette et Poisson. Sunday evening on the Nortel Networks Stage began with the joyous sounds of the Ottawa Folk Festival Weekend Choir. Although storm clouds were gathering, the choir proclaimed in song that the storm was going to pass over. And it did! Big Gravel, a Toronto-based ensemble exploring fiddle music, swing and new acoustic styles performed next. Terry Tufts, a favourite of Ottawa audiences, delighted the crowd with his inspired vocals and intricate guitar playing. The original and amusing story songs of Vance Gilbert provided a highly entertaining set. The dynamic Sudbury-based group No Reservations was accompanied by a mesmerizing dancer wearing a traditional raven costume. There was barely a dry eye in the park when Chopper McKinnon accepted the Helen Verger Award for his role in promoting and supporting Canadian folk music. The host of the CKCU-FM Radio show Canadian Spacesfor 19 years thanked his fans. The Space Cadets were out in full force to cheer on Chopper. Locally based and globally admired singer-songwriter Ian Tamblyn entertained the crowd with a sampling of his eclectic material.Cry Cry Cry, an American folk dream team, featured Dar Williams, Lucy Kaplansky and Richard Shindell. The singing poetry of the provocative Laura Smith stays in your mind long after you hear it and this performance was no exception. The lively sounds of the Newfoundland-based group Rawlins Cross, spanning Celtic, rock and traditional Maritime music, ended yet another incredible weekend of folk music at Britannia Park!